Beyond the absolute essentials like shelter, sleeping bag, and food, a good backpacking multi-tool may be the most useful piece of outdoor gear that will accompany you. What’s more, a multi-tool’s usefulness and practicality is not limited to the outdoors. They are a one-stop tool kit for the home, office and car. 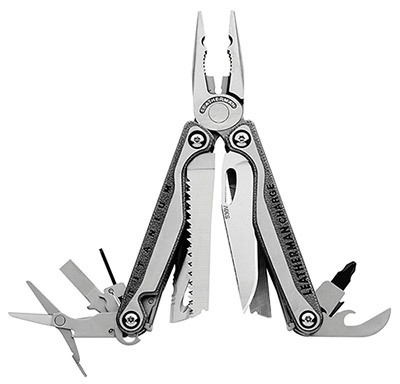 The price for multitools varies considerably from around $170 for the Leatherman Charge TTI to around $40 for the Gelindo Premium Pocket. 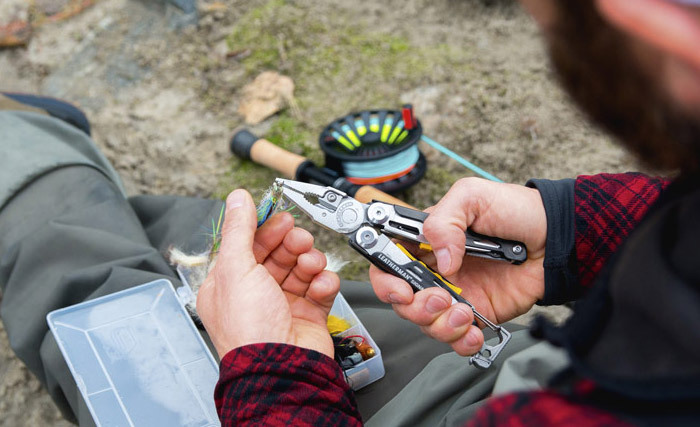 The multi-tool you choose and the price you pay will vary depending on the functions you plan to use the multi-tool for and also whether you plan to own one or several, one for outdoors, one for home and one for the workplace. Here are five popular and functional backpacking multi-tools, pick the one that’s right for you needs. 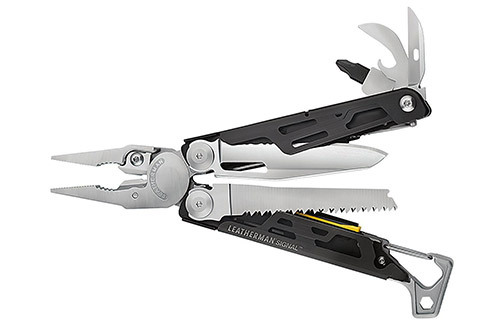 Ideal for backpacking, Leatherman’s Signal multi-tool has unique features including a safety whistle, fire-starting ferrocrium Rod and a Diamond sharpener to keep the edge on your blades. Signal comes with a nylon sheath. And, it’s a bit lighter than your average full-size multi-tool. Needlenose pliers, regular pliers, premium replaceable hard-wire cutters, premium replaceable wire cutters, crimper, wire stripper, 420HC combo knife, saw, hammer, awl with thread loop, can opener, bottle opener, 1/4″ hex bit driver, bit driver, 1/4″ box wrench, caribiner, 3/16″ box wrench, safety whistle, ferrocerium rod, diamond-coated sharpener. 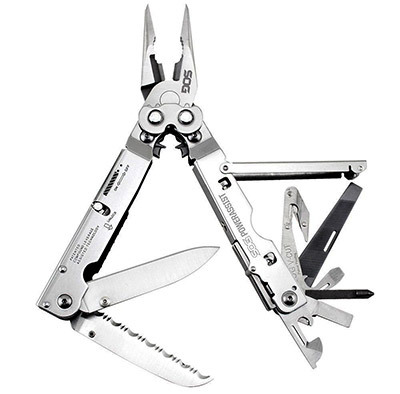 The Leatherman Charge TTI is the signature tool by the most respected multi tool manufacturer. It’s price of around $170 reflects that. The Charge has two times as many many tools as the next multi tool. It is an engineering work of art. The pliers perform four functions: needle nose pliers, inset crimper, serrated gripper jaws for tightening nuts and bolts and wire cutters. It has two blades, one straight and one serrated. A hook-shaped blade will slice a seat belt in an emergency situation. It has two saws, one for wood and one for metal. It has diamond file that sharpens carbide steel tools. Other tools include scissors, 3 screwdrivers, a bottle/can opener. All tools lock in place. The handles are rounded. The Charge comes with a choice of a leather or nylon sheath. Needlenose pliers, regular pliers, hard-wire cutters, wire cutters, crimper, wire stripper, S30V knife, 420HC knife, saw, spring action scissors, cutting hook, ruler, can opener, bottle opener, wood/metal file, diamond-coated file, large bit driver, small bit driver, medium screwdriver. Victorinox has made the popular Swiss Army Knife for years. Recently they have begun manufacturing a multitool in direct competition with the Leatherman the most recognized name in the category. The Victorinox SwissTool Spirit X claims to have 22 functions although some of the functions are double dips listing the wire cutters as “soft wire cutter,” “hard wire cutter,” and “wire bender,” for example. 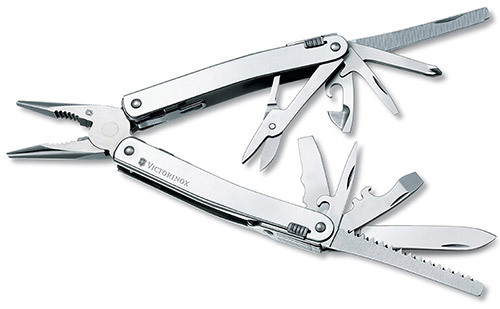 The Victorinox has a good basic set of tools including pliers and scissors. It as two saws, one for wood and one for metal. The tool fits comfortably in the user’s hand. The Victorinox comes with a leather belt sheath. Screwdriver (2mm), screwdriver (3mm), screwdriver (6mm), Philips screwdriver, crate opener, scissors, metal file, wood saw, metal saw, wire cutter for thin and soft wire up to 40HRc, reamer, screwdriver, chisel / scraper, wire bender, wire scraper, can opener, multi-purpose hook. The SOG PowerAssist is large, bulky, and built to last. The feature that sets this tool apart from others is the “geared pliers.” This increases the amount of pressure you can apply to gripping a nut or bolt. The wire cutters are excellent and can cut large wire but has no wire-stripping capability. The needle nose pliers taper to a extra fine point, which is a plus compared to other tools included here. Other features include two a can and bottle opener, screwdrivers, a file and a cord and webbing cutter. All of the tools are easy to open and lock securely in place. The PowerAssist comes with a belt sheath that closes with velcro patch. Taking into consideration functionality and price the Gerber Suspension Multi-Plier is a good value. The Suspension’s functions include pliers, blades, screwdrivers, a wood saw and scissors. The tools are available without opening the pliers. The rounded design of the Suspension makes it user friendly. Right-handed users will be able to open the blades one-handed thanks to thumb catches. The Suspension comes with a nylon and velcro case. 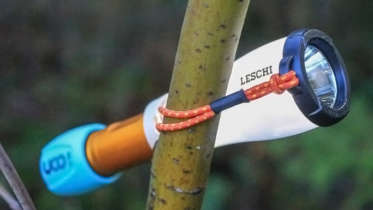 The Gelindo Premium Pocket is an inexpensive basic multi tool. It has pliers, a blade, a saw, can and bottle openers and screwdrivers. It has no scissors which is a noteworthy omission. The tool has a broad, rounded profile. It is suited for large hands. The corners are rounded making it as unobtrusive as possible when carried in a pocket. It comes with a snap closure best sheath. Test show that the Gelindo Premium Pocket does not hold its edge as well as some other tools in this list and requires sharpening more often. Consider the Gelindo as a good gift for a young outdoors person who is beginning to collect an inventory of outdoor gear but may not be ready for a top-or the line multi tool like the Leatherman Charge TTI. It is also the ideal addition to a car glove compartment where it may not be used often but is there when needed. 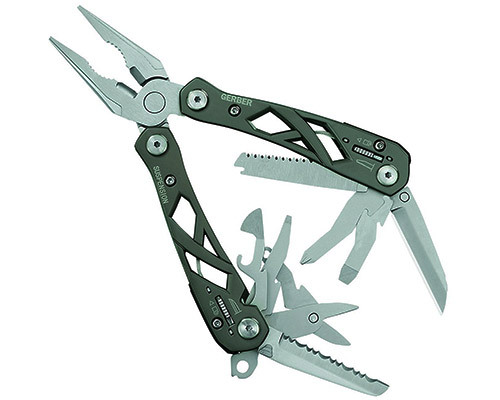 Be the first to comment on "Best Multi-Tools for Backpacking"